David Livingstone lived from 19 March 1813 to 1 May 1873. From a childhood of poverty he became one of the most famous of the European missionaries and explorers who opened up the interior of Africa during the mid 1800s. Such was his celebrity in his own day that when he died in Africa, his body was returned for burial in Westminster Abbey. David Livingstone was born in Blantyre, at the time a mill village on the banks of the River Clyde some eight miles south east of Glasgow. His mother and father were among the 2000 people employed in the Blantyre Cotton Mills and the family, including David's four brothers and sisters, lived in a single room in a tenement they shared with 23 other families in what was known as Shuttle Row. 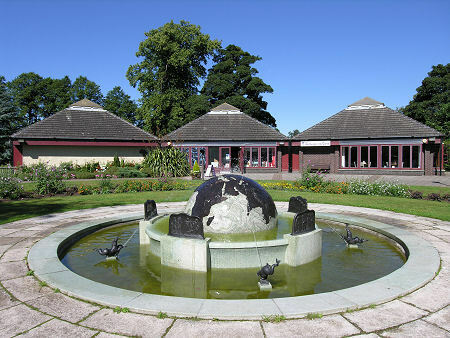 This now forms part of the David Livingstone Centre, a museum commemorating Livingstone's life and work in his native Blantyre. 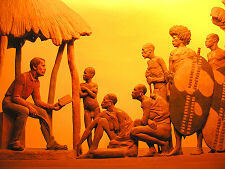 You can find a biography of David Livingstone here. 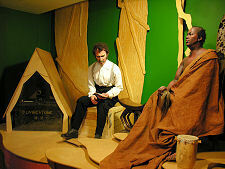 This page looks at the David Livingstone Centre. This is found on the north east side of Blantyre, surrounded on three sides by a loop in the River Clyde. The Blantyre Cotton Mills that ran alongside the river here have long gone, replaced by 20 acres of gardens and parkland. 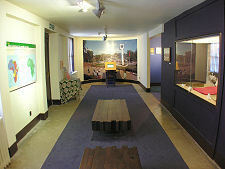 Within this you find the three storey white-harled Shuttle Row, where Livingstone was born and which now forms a museum dedicated to Livingstone's life and work. 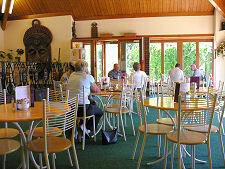 Nearby is the attractive modern Visitor Centre, in which you find the reception, shop, and restaurant. It is two recent additions to the Centre that first catch your eye as you approach from the parking area. 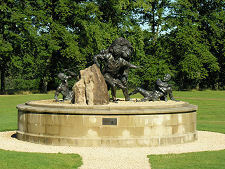 The first is a huge and complex bronze sculpture on a plinth depicting the moment at which Livingstone was attacked by a lion. This vibrant statue was designed and funded by the Oscar-winning animator Ray Harryhausen and his wife Diana, who is David Livingstone's great-granddaughter. It was erected here in April 2004. The second is an even more recent arrival, a fountain in the form of a half globe over which jets of water are projected. 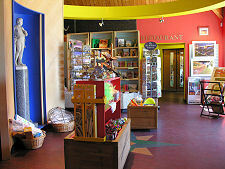 The visitor centre is housed in a three segment single storey brick building. This should be your first port of call. The reception area shares the middle segment of the building with the shop. An educational area occupies one end segment, while in the other is the Centre's restaurant. 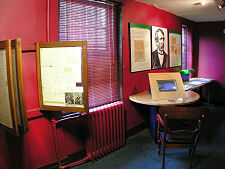 But the real heart of the David Livingstone Centre lies in Shuttle Row. This comprises a bulky three storey building, with a "tail" of less imposing two storey buildings: all strikingly harled in white. Today the smaller buildings form a conference suite and are not normally open to the public. But the whole of the larger part of Shuttle Row is given over to the Centre's museum. As you approach Shuttle Row it is easy to image Livingstone's birthplace to be a grand mansion. 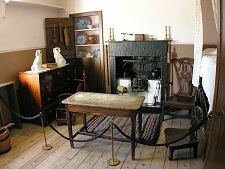 The truth is very different, as you see inside, where the single room in which his family lived is faithfully recreated. 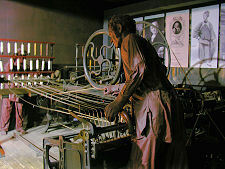 The museum also contains areas devoted to different aspects of this compelling and complex man's life. The overall effect is fascinating. Some of the collections and displays in the museum date back to the initial conversion of Shuttle Row into a museum devoted to Livingstone in 1929, but much of it is more contemporary. 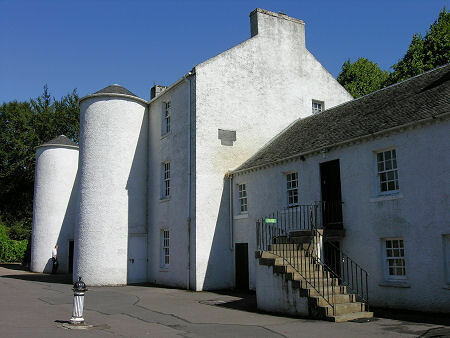 The National Trust of Scotland have managed the David Livingstone Centre since 1999.